*REGULAR MEMBERSHIP RATE IS $40. BUY TICKETS NOW! Jay Hansen, the new President and CEO of the California Foundation on the Environment and the Economy – and a recipient of Sacramento Stonewall’s prestigious “4 Freedoms” Awards- recently worked as the Chief Strategy Officer for the California Medical Association, where he helped 40,000 California doctors and medical students best serve their California patients. He previously served as the Legislative Director for California’s building trades workers and in the State Capitol for four different Speaker’s of the Assembly. Jay’s extensive government experience helped him effectively navigate SCUSD’s bureaucracy as a school board trustee and brought new partnerships to the District. 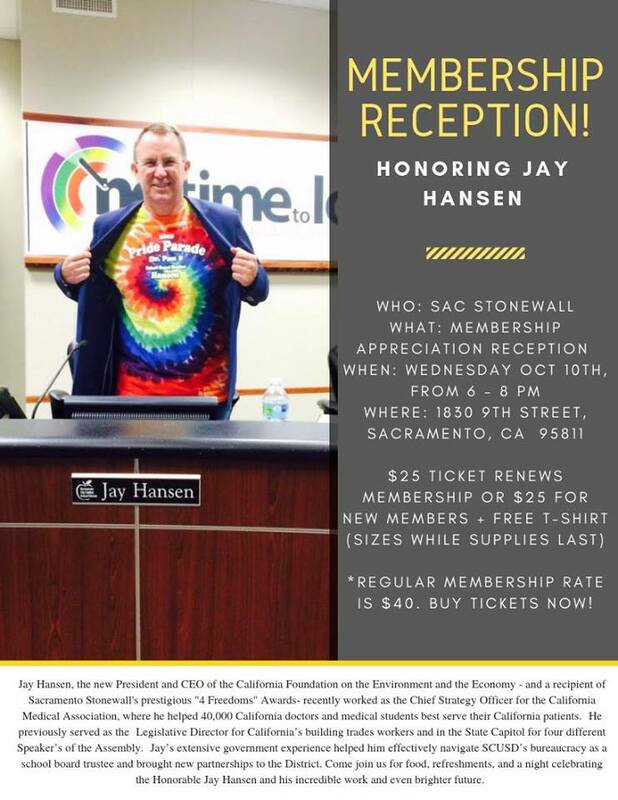 Come join us for food, refreshments, and a night celebrating the Honorable Jay Hansen and his incredible work and even brighter future.